As everyone knows by now I have a love affair with shoes! Its my one thing that I do not bat an eye to spend money on and indulge in. Its a functional habit after all since we all need shoes for our feet! I have a shoe must have list and a pair of comfy red shoes is on it. Sure I can buy some cheap heels and have red shoes but part of looking good is feeling good too. If you have on shoes that are not comfortable you can see it on a woman's face and how she walks. A woman that is rocking a pair of red shoes that are comfy is just awesome! Being on my feet all day at work and chasing a toddler around on my days off I knew I needed some flat red shoes that I could feel cute in and run, jump and play in. 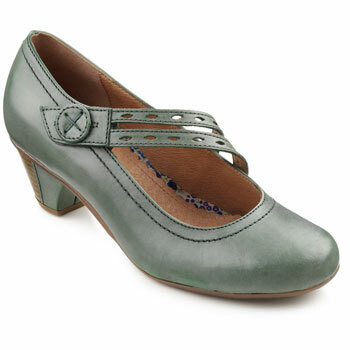 I found a great UK company, Hotter that offers cute and comfy shoes for every occasion. I love being able to have online shopping connect me with companies I might not have found if not for the net. Hotter has many styles for heels, wedges, sandals, boot, flats and even a Men's line. 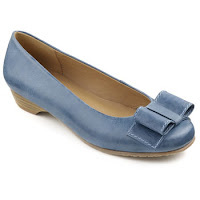 Plus they even carry cute shoes in wide widths! 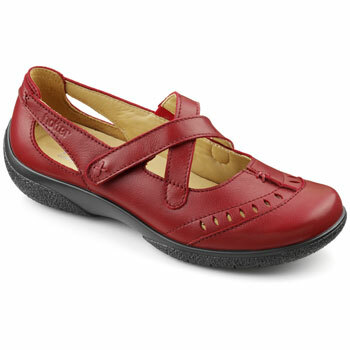 Since Red Shoes are on my shoe must list I selected the Lulu shoe in Chili Red. I LOVE the fit of this shoe. It runs true to size and is so comfy it feels like your not wearing any shoes at all! The red is a nice pop of color to any outfit. The design I liked for being comfy with the top strap and the side having a design cut out for air venting. I can wear these even without socks into the summer on days I do not feel like wearing a sandal. They are cute, feminine and sooo comfortable I love that they were comfortable from day 1, no wearing them in or anything. The toe box is spacious allowing for perfect comfort. I wore these to work and my co-workers loved them. I am on my feet all day so comfort is a must. *Limited to US residents 18 years old and above. Giveaway starts Feb 9 2013 and ends on Feb 17, 2013 at 12:01 am EST. Winner will be emailed and has 72 hours to respond before another winner is selected. I was not paid for this giveaway or post. The opinions on this item are 100% mine and may vary from others. The sponsor is responsible for providing the prize. I was sent a product to review for this post. These look cute and very comfy! 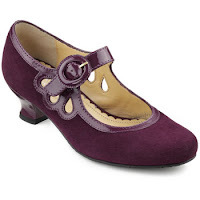 I LOVE the http://www.hotterusa.com/en-us/Women/Shop-By-Collection/Trends-Collection/81172_amethyst-shoes - especially in Grape Juice and / or Green. Thanks - great shoes! I like the Pixie boots. Tough decision -- at this moment, I like the Jazz Shoes! The Bliss Extra Wide Shoes in Damson look very nice!